OSS Line talks with Keith Brody and Ola Billinger from DigitalRoute about how mediation for OSS can solve the challenge of getting data to where it needs to be. OSS is full of data. Data is everywhere in various forms and in various states of change. It could be inventory about your physical equipment – data that is highly structured, changing very slowly and deliberately. Or it could be a real-time feed of network traffic statistics – A stream of simple parameters that only mean something when analysed over time. The challenge is getting that data where you need it to feed OSS processes, as well as transforming it and combining it to create information that can be actioned. 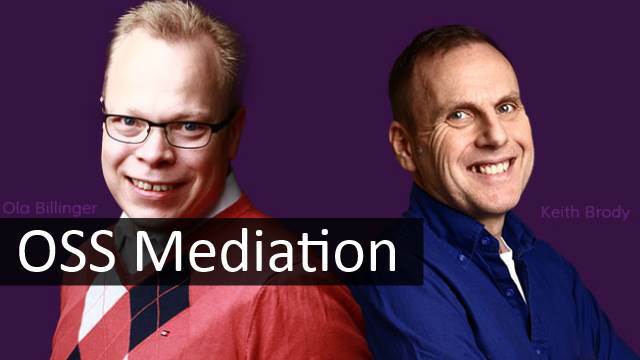 A couple of weeks ago I spent some time talking to Keith Brody and Ola Billinger from DigitalRoute about this challenge, with the goal of understanding how OSS Mediation helps, and whether it’s any different from the ways we have been integrating OSS systems for the last 10 years. Mediation is perhaps more associated with BSS, where the objective is to retrieve call duration records (CDRs), then process them efficiently, to ensure customers are correctly billed – Without mediation there are no bills, so no income for the service provider. Billing is important but without OSS a service provider cannot create new services and deliver them to their customers. Historically, OSS data integration has been dominated by either bespoke, self-built, integrations using common programming tools, or by ‘silos’ of application-specific, single-purpose integrations from OSS vendors. Soon, the old way of integrating OSS data will cease to be fit for purpose. Service providers, networks and OSS are changing: Service providers need greater agility to introduce communications products; Networks are transitioning from being relatively static physical entities, to being virtualised – resizable and reconfigurable almost in real-time; OSS is becoming more customer-focused and real-time too, in step with the network and business changes. Sometimes what’s needed is just getting the data flowing to allow OSS to function. As data and the business changes, keeping things flowing will be important enough. This leads to the one big question I had for Keith and Ola: How is OSS Mediation different from other OSS products or build-it-yourself solutions? The key to any OSS Mediation Solution being the right solution for a service provider’s integration needs depends on whether it sits in the sweet spot on the spectrum between build-it-yourself and a silo product. Build-it-yourself offers ultimate flexibility, but long development times and expensive on-going R&D to keep it relevant. A silo product, a standalone performance monitoring tool for example, is developed by a third-party, should be simple and quick to deploy but then usually only fulfils a small number of use-cases with such ease. For OSS Mediation to be beneficial, the Goldilocks Zone is a product that is both configurable without requiring a team of developers, and comprises a useful amount of pre-integration and processing capabilities for the sort of data found in OSS environments. It turns out that DigitalRoute’s past may make it more relevant in the future. Fifteen years ago, the team that was to become DigitalRoute had developed a capable, but generic, java-based platform for doing mediation between… anything with data in it. It was a solution at the build-it-yourself end of the scale. More than starting from scratch with a set of JEE libraries, but it needed configuring for a particular use-case and I suspect you had to know what you were doing to get results from it. At that point though, the technology found a specific problem to solve: BSS mediation. Processing those call duration records I mentioned earlier. And so DigitalRoute became a BSS mediation company. Jump back to the present, fifteen years later, and we have an interesting situation: A generic, configurable data integration platform, with the benefit of fifteen years of specialization for the telco industry. And an industry need for better data integration for OSS. So OSS Mediation was not so much created, but evolved from a combination of DigitalRoute’s technology, telco experience, and the changing needs of service providers. And thanks to its origins, OSS Mediation has a better chance than many solutions of being in the Goldilocks Zone. With the demands for rapid analysis and response to data, combined with more data being generated in real time from more parts of the network, it is simply not feasible to give the job of data integration to your own developers. Even good ones. I would imagine a small team of good developers could be handed some call duration records and produce, in a reasonable time, a bespoke data processing tool. It wouldn’t be reusable anywhere else, but it might serve the purposes of a one-off integration that will stay in place for the next 5 years. Same goes for many other traditional telco data sources. In the past the network was pretty static, the data was slow, and where it was real-time its scope was at least manageable. Today, virtualisation means those assumptions are gone. The trend is towards everything being software driven and dynamic – Changing frequently and generating a lot of data. Only developers who live and breathe data have a chance of producing robust, reliable and performant integrations. Only developers who have telco domain knowledge can produce integrations that can be maintained and updated for long term use. Let’s me be clear: Data integration – at least data integration in the heart of your OSS – has to be a product from a company that specialises in this stuff. Integration tax is a reality of OSS: It’s not easy, and it can be expensive to hook up your data and processes. The best thing you can do is ensure those tax dollars go a long way, supporting future needs as well as today’s projects. If build-it-yourself is a thing of the past, replacing silos probably should be too. If we can break down the two really big silos of OSS and BSS (and it strikes me mediation is probably best placed to do so, considering its history), we really would have a single view of the business to close the loop on selling services, delivering quality, and keeping the customer happy. The half a dozen of you who have read my very first posts on OSS Line will know I spent a lot of time tackling data integration. My best advice is this: Consider all your options. Check out mediation. To learn more about OSS Mediation specifically, take a look at DigitalRoute’s own information on this subject.